I didn't even like chocolate ice cream growing up. I know you're all like "Kayle, it's like we don't even know you." I totally have an explanation though! You see, chocolate ice cream was never chocolatey enough. I'd never had any that fit the bill. 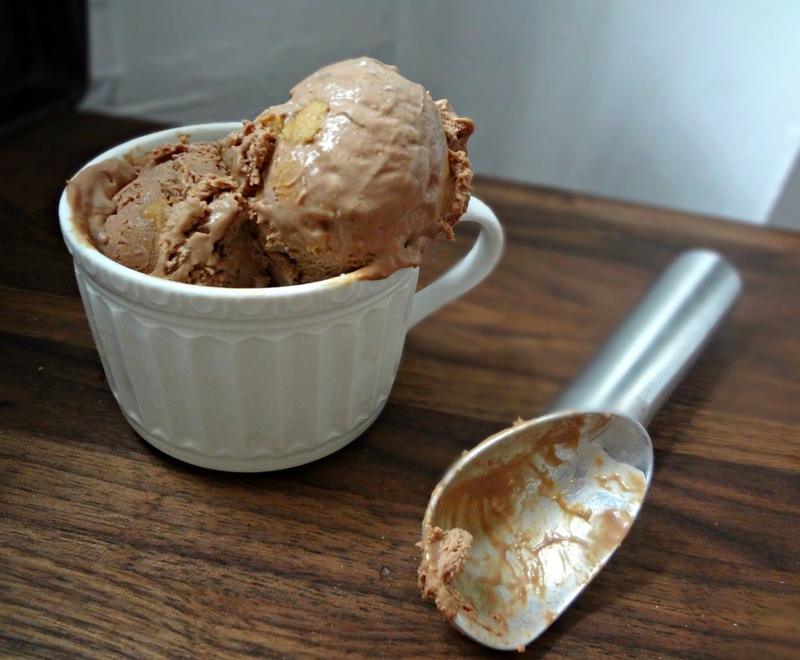 Now, as an adult, I've had a few kinds of chocolate ice cream that were enough to please my taste buds, but my absolute favorite is Ben & Jerry's chocolate peanut butter swirl. Because...you know...peanut butter is always a welcome addition to chocolate. Anyway, usually when I make homemade ice cream (sans ice cream maker, since I currently don't have one) I make whatever Michael wants-because he's the major ice cream lover and it's not usually my fave dessert. But it's summer, people, and even I want some nice, cold, ice cream. But...it's me...so obviously I'm not gonna eat the fruity "refreshing" stuff I make for Michael. 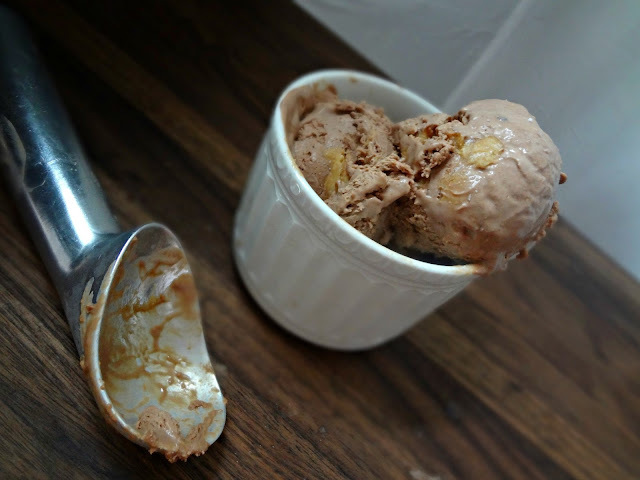 I wanted something like that wonderful chocolate peanut buttery goodness from Ben & Jerry's. Is this ice cream exactly the same? Is it pretty close and super duper delicious? Dark chocolate ice cream with chunks of rich, delicious, salty peanut butter....mmmm. 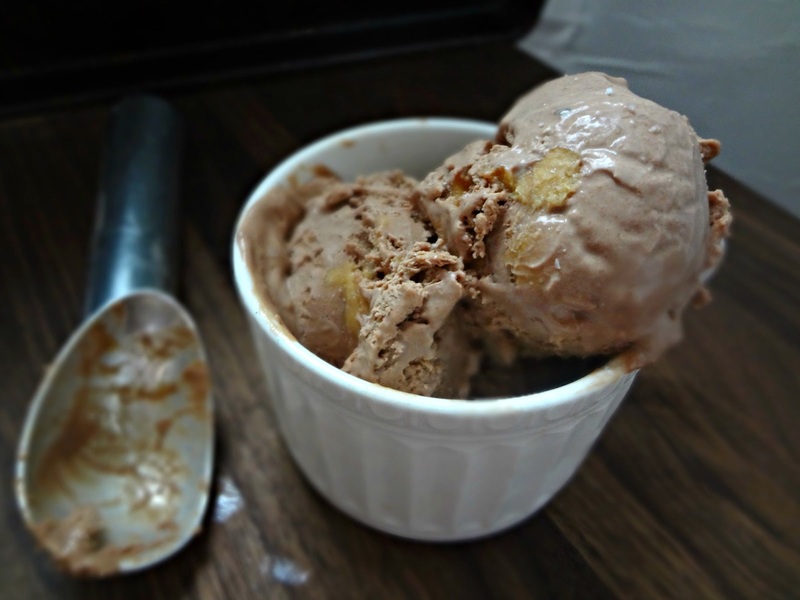 This was an ice cream both Michael and I could love, and seriously, it is so simple to make. It's like crazy. So really what I'm saying is you have 0 excuse as to why you shouldn't just make this as soon as possible. Come on, it's hot out there, make some ice cream! 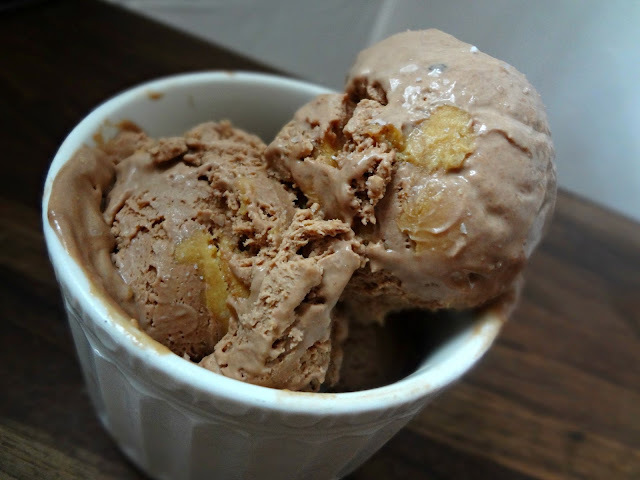 Adapted using elements from Brown Eyed Baker's "Chocolate Fudge Swirl Peanut Butter Ice Cream" and using "Easy-NO ICE CREAM MAKER-2 Ingredient Ice Cream" method. In a small bowl combine the peanut butter and powdered sugar. Line a plate with plastic wrap. Break off little pieces/"chunks" (about 1/2 tsp. each) of the peanut butter and place on the lined plate. Place in the freezer until frozen (duh). If you wrap the pb pieces well they will keep in the freezer for up to 1 month. Melt dark chocolate (chip or bars) in whatever method you prefer (microwave or double broiler), using however much you want-depending on desired intensity of chocolate flavor. 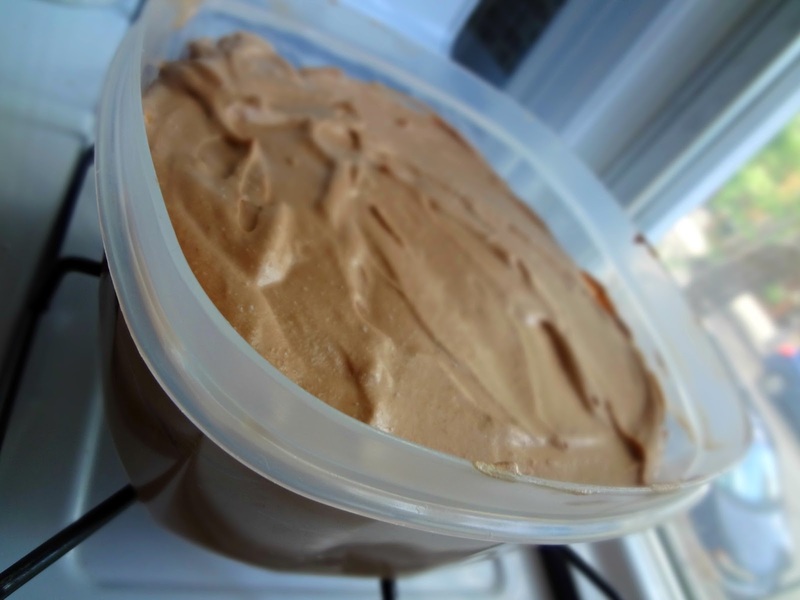 In a medium-large bowl whisk together the sweetened condensed milk and melted chocolate. In a separate bowl (preferably chilled) pour in heavy cream. 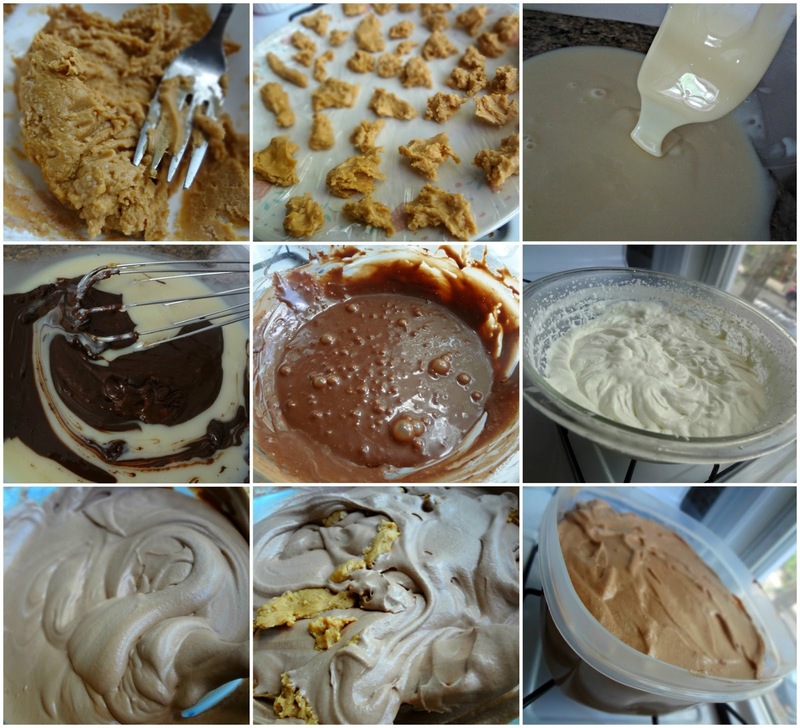 Using a hand mixer (or a whisk if you want to be all old school about it) beat the cream until stiff peaks form. Once thoroughly combined fold in the frozen pieces of peanut butter. Pour into an airtight container (and, if desired, sprinkle a little kosher or sea salt on top) and freeze for at least 6 hours before eating.